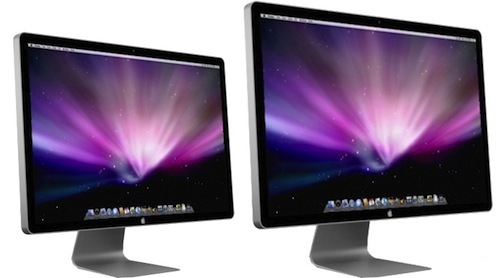 27-Inch LED Cinema Display Coming Tomorrow Alongside iMacs and Mac Pros? In announcing the return of his podcast talk show, the plugged-in John Gruber slyly hints, as he is wont to do, that Apple may be set to release a new 27-inch 16:9 widescreen display alongside updated Mac Pros and iMacs tomorrow. We'll have much to talk about, what with the new Mac Pros (finally, right? ), speed-bump iMacs, and the gorgeous new 16:9 27-inch Cinema Display that Apple might hypothetically release tomorrow. The Mac Pro and iMac have been subjects of considerable discussion over the past few days as their availability has begun slipping in several of the company's distribution channels. A 27-inch LED Cinema Display is not a new rumor, however, as a report from March of this year pinpointed a release of just such a display along with revised Mac Pros "by June" of this year. While Apple did not meet the rumored release timeline, it appears that both products may be set to finally make their appearance along with minor bumps to the company's iMac line. Update: In an update to his post, Gruber suggests in a "doubly-hypothetical" manner that Apple's "Magic Trackpad" that was approved by the U.S. Federal Communications Commission last week could also make an appearance tomorrow.